One of the many lessons I learned early on from my father was the importance of learning and pronouncing people’s names correctly. My dad, who was also my FFA advisor, made sure to teach the lesson every year as we prepared for our annual FFA chapter banquet. See, during our banquet, we awarded every student in the program at least once and the awards were presented by fellow members of the chapter. For many students, this was the first time they’d ever been recognized for anything. And, for most, their parents would be in the audience. It was a moment to be proud of. Now, think how hard it would be to have your name mispronounced in front of a crowd of people as you’re getting an award (maybe your first one ever). Tough, right? Now, I won’t say that names weren’t ever mispronounced. After all, we were high schoolers and because of how our program was structured – students from seven different schools came to my dad’s agriscience class for half of their day; some in the morning, some in the afternoon – there was always the possibility that the student giving an award had never met the person receiving the award. It wasn’t a perfect system. But the lesson was taught to each student, year in and year out, that we should all do our best to learn everyone’s name and how to pronounce it. The parents in the room worked hard to pick that name. As we’re honoring their child, they should be proud to hear that child’s name announced – and announced correctly. I’m currently reading the famous book “How to Win Friends and Influence People” by Dale Carnegie, and I recently finished the chapter on this same idea. As he says “Remember that a person’s name is to that person the sweetest and most important sound in any language.” To remember someone’s name is to show them respect; it demonstrates that you care and understand the important part they play in the world. Here’s some tips we can all use to better remember and pronounce names. Do you have any others to add to the list? You just bought this truck. If you didn’t want it, you shouldn’t have bought it. We are saving up for a wedding. You don’t need to be spending money on toys. How are you going to haul things without a truck? Yes, I know it seems fun, but do we really need it? I don’t know why you have to change vehicles so often; this is the fifth vehicle you’ve owned in the seven years we’ve been together. Amanda: A vehicle should be driven until it dies, paid off so you can save money for something new. Mitch: A vehicle should be driven until I find something better (and not lose any money). Amanda: High dollar purchases give me anxiety. Mitch: Can I afford it? Awesome. Moving on. It’s not uncommon to have differing philosophies in a relationship, especially about money. But, at the end of the day, we have one overriding policy between the two of us: if it doesn’t affect our joint finances, I don’t tell him how to spend his money and vice versa. We’re too independent to like being told what we can and can’t do with our respective incomes and so we’re good with this compromise. Which is why, last Tuesday night, Mitch became the owner of a 2008 Jeep Rubicon. As we’ve been having this argument, all of my points centered around fear. Fear of spending too much money. Fear of not having enough money for the wedding. Fear of getting into the habit of frivolous spending. But those are my fears, not Mitch’s. He knows he can afford it and he’s better than me at looking at the bigger picture. He saw how driving a Jeep could allow us to have better experiences than his former vehicle. Not just for him, but for us as a family. Our first family ride in the Jeep with the top off, feeling the wind in our hair (or fur). Nothing like taking the Jeep to get some ice cream – even Leo got his “pup cup”! My sister and her boyfriend joined us to do a little off-roading in the Jeep. When you’re flying at 60 mph down bumpy 2-lane seasonal roads, your hair’s going to get a bit crazy! I have a bad habit of getting a little too uptight, and not enjoying the moment for what it is. But Mitch’s “frivolous” purchase was one more example of how he consistently shows me how to loosen up a little, chill out and have fun. So here’s to many more off-roading, wind in our hair, singing to the music moments in the Jeep! When I joined Twitter in college, one of the first communities I joined was #agchat. Here was an online group of people in agriculture, coming together once a week to talk about different topics related to food and farming. Out of that experience, I made some amazing friends, got to travel to new places, and had one of my first event planning gigs. After I graduated, I became less and less involved with #agchat – mostly because, when I moved to Minneapolis for work, I felt less and less connected to the agricultural world that I grew up in. It was a community I was familiar with, but really no longer felt a part of. When I stopped participating, though, my Twitter activity overall became almost non-existent. About six months ago, I found myself wanting to find that bond of community online again. I started posting on Twitter. I started following people. I started reading and sharing interesting articles. But I was still flying solo in a world that thrives on making connections. 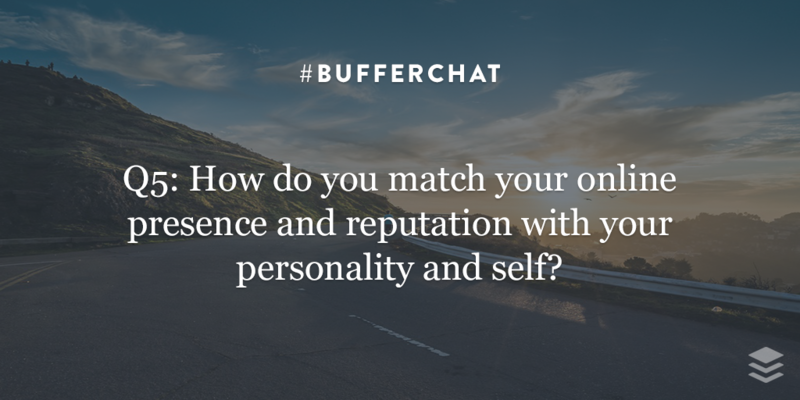 #bufferchat is run by (not surprisingly) Buffer — a start-up company that creates software for scheduling social media posts. I stumbled upon them in a Fast Company article and was intrigued by what they are trying to do as a transparent company with no managers and positions like “Happiness Heroes.” I set up an account and gave them a follow on Twitter. I figured that’s where it would end. However, #bufferchat turned a random follow into full-fledged engagement. Similar to #agchat, #bufferchat is a weekly discussion on Twitter where thousands of people from around the world come together to talk about the week’s topic. Last week it was about building your reputation online. The week before that it was about using digital tools to stay organized. It’s always facilitated by the Buffer team (and sometimes there’s a special guest), but it’s not marketing spin. It’s a true discussion. It’s fast-paced. It’s engaging. And it’s my favorite part of Wednesdays. Just like I’d felt with #agchat, #bufferchat has helped me re-discovered the purpose of a social media tool like Twitter. It’s there to facilitate conversations, to help make connections with others, and – just maybe – create a community where you can build true relationships. Hope you stop by for #bufferchat some time. There’s a great group just waiting to say ‘hi’. Top 5 holiday weekend highlights! It’s been a long time since I’ve taken a vacation, but this past weekend I disconnected and headed to northern Michigan to spend 4th of July with my fiance Mitch’s family at their lake cottage. While I didn’t get all the things I had planned to do accomplished, it was amazing to stop worrying and just enjoying being with great people having fun. Last week, Mitch bought a Jeep (more on that in the future) and this weekend we really got to see what it could do. Northern Michigan has some great two-track seasonal roads that we went and played on, and we were lucky enough to have my sister and her boyfriend come and join us! Most of these northern Michigan towns are pretty small, but we took some time to cruise into Harrison in the Jeep (top off!) to get some ice cream. My dog, Leo, even got to get in on the fun! On Saturday, Mitch and I drove over to Holland to watch one of my best friends, Robyn, get married. Robyn and I have been friends for about 18 years, starting with doing gymnastics together. It was great to see her take her next step in life with a wonderful man and see the love they share for each other. Robyn was a beautiful bride! It was so great to celebrate with her and our two other best high school friends, Holly and Nicole. Mitch and I clean up pretty well! It’s not 4th of July in Michigan without a little time on the water. Between getting the pups on board, getting a good sunburn tan, and watching fireworks from the pontoon while they went off from all directions around us, there’s nothing like a little boat time to boost your spirits. Leo absolutely loved the boat – this is his “happy face”! Over the past seven years, it’s been awesome to get to know Mitch’s family and hang out with them on weekends like this. In the next two months, their current cottage will be demolished to make room for a newer one that will fit the growing number of people who come to the lake and enjoy each others’ company. This last weekend at the current cottage was a great time to reflect on lots of good stories and make a few more. Plus, I was especially glad that my sister and her boyfriend could join us for a day of boating, off-roading, swimming with the dogs and playing games. This is what a holiday weekend is supposed to be about and we did it in epic style. Can’t wait for the next lake weekend and a chance to make even more memories. Hope you had an equally awesome 4th of July with your friends and family! Today’s July 1st. A new month. A brand new beginning. I personally love that the start of July kicks off with built in vacation. Since 4th of July falls on a Saturday this year, my office is closed on Friday. That means I’m heading to my family’s cottage Thursday night to get my relaxation started right – ka-ching! It’ll be a weekend of family, celebration (one of my best friends is getting married! ), hanging by the water, a little boating and lots of decompressing. One of the things I’m really looking forward to doing while at the lake is spending some personal time on reflection and growth. I’m planning to do some reading and writing, which I haven’t been very good at making time for. I want to do some goal-setting. I want to spend some time just…being – soaking in the peace and quiet that comes with an early morning on the deck while the only people on the water are the fishermen. This weekend will kick off what is sure to be another busy month of travel and work. But, for three short days, I plan to slow it down, take a step back and soak it all in.